Working as a health educator with thousands of people with chronic illness and cancer, Chris noticed that almost all struggling with common symptoms had an underlying sleep disorder. In the workplace, she also noticed that brilliant, talented employees, young and old, were showing up fatigued and drained. They were overlooking the cost and risks of poor sleep. Chris has been delivering programs to corporate, clinical, healthcare and public groups for 30+ years. You can always completely depend on her to deliver a professional, respectful program that results in meaningful, measurable change. We know what it takes to make your next meeting a success. Organizations, families and individuals need to wake up! Employee wellness efforts have focused on nutrition, exercise and stress management for decades, but the key aspect of sleep has been neglected. Sleep medicine research has definitively clarified that healthy sleep is the factor that underlies successful management of stress, mental clarity for decision-making and handling conflict, and generation of physical energy. 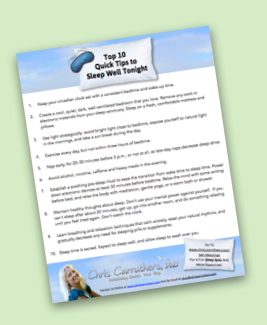 Chris wants you to become more aware of the importance of sleep. Chris’ special interest is sleep education, but you can book her to speak on a variety of health and wellness topics. People who meet Chris remember her. And they remember her message. Your audience will resolve to better manage their health and feel great about being in control and being the best of themselves. Your audience will leave with meaningful tools, techniques and resources that they can immediately apply to their personal challenges. Chris knows that each listener has personal issues, questions, and an individual learning style. Guests will depart the room feeling understood, energized, and more confident than when they entered. Chris’ talks are interactive, fun, and entertaining. When she speaks, people listen. She leverages her experience, attitude, knowledge and perspective to create possibilities for change in the listener. Concepts are delivered through stories from real people who experienced better health – not dry professorial directives. You won’t see dull, text-heavy screens with Chris. She wants the viewer to enjoy the experience and not feel like they are reading a medical journal. Chris is compassionate and empathic, with real-world experience inside the healthcare system both as a service provider and consumer. She knows the challenges of health management within the workplace and the healthcare system. Chris’ approach to improving health has a different and compelling perspective, built from the integration of her conventional healthcare training with her own experience of chronic illness and navigating an exceptional recovery. Chris is professional, accommodating, and easy to work with throughout every step of the relationship, from first contact through follow-up. Chris takes the time to learn about your people, organization, and what is most important to you. Her presentation will be on-point, relevant, and customized to your specific needs. Chris’ mission is to help others feel great about who they are, and feel confident that they can handle anything life brings their way. Chris is recognized for her expertise in sleep health, integrative cancer care, and the relationship between spirituality and health. She is professionally trained as a speaker and facilitator, and all messages are designed so that people and organizations are inspired to develop their full potential; they are excited to put their plan into action; and they will ultimately achieve clear and meaningful results. Sleep is a partially learned skill, and you can be in control of the quality of your sleep. Become more aware of the value and necessity of healthy sleep, and learn three simple skills to assist in gaining maximum sleep benefits. 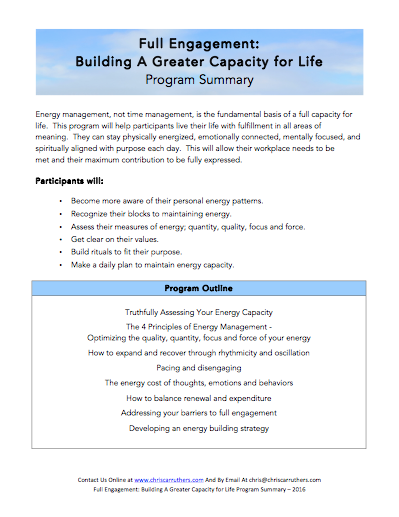 Energy management, not time management, is the fundamental basis of a full capacity for life. This program will help participants live their life with fulfillment in all areas of meaning. 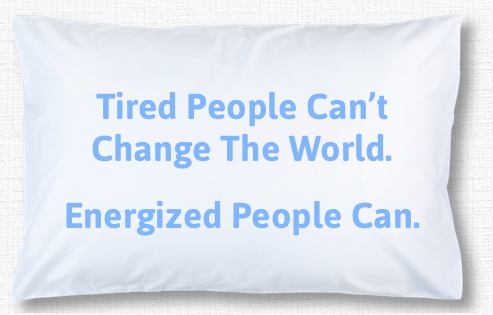 They can stay physically energized, emotionally connected, mentally focused, and spiritually aligned with purpose each day. This will allow their workplace needs to be met and their maximum contribution to be fully expressed. Evidence from clinical trials shows that spiritual awareness and practice can improve mental health, symptom management, and workplace engagement. 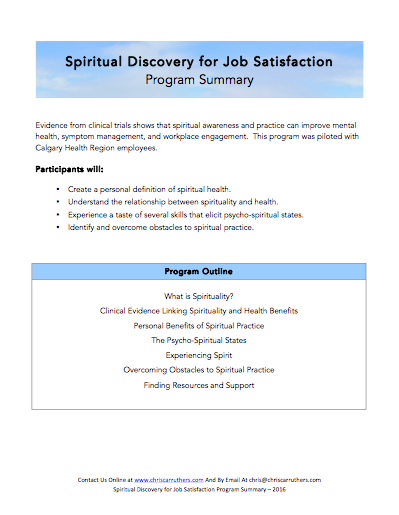 This program was piloted with Alberta Health Services (Calgary Health Region) employees. 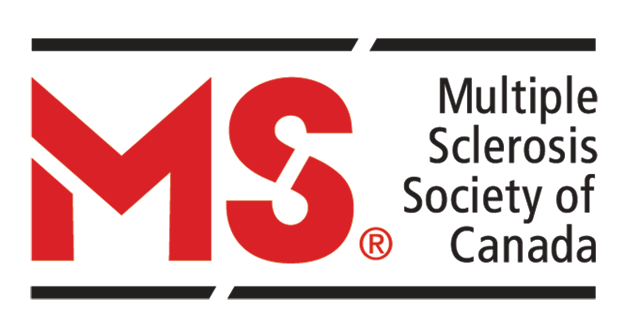 The current Canadian Cancer Society data states that one in three Canadians will have cancer during their lifetime, and that about one-third of 12 major cancers can be prevented. 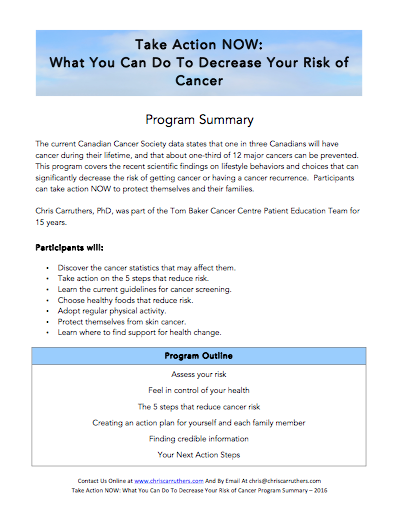 This program covers the recent scientific findings on lifestyle behaviours and choices that can significantly decrease the risk of getting cancer or having a cancer recurrence. Participants can take action NOW to protect themselves and their families. 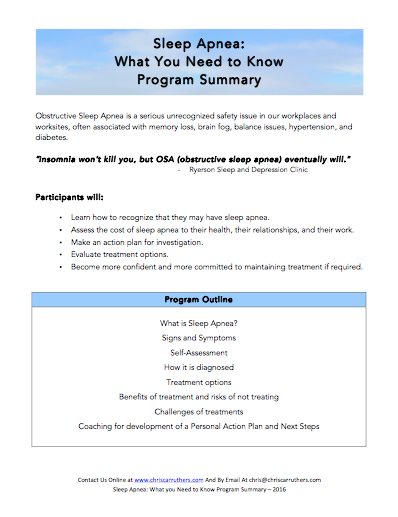 Obstructive Sleep Apnea is a serious unrecognized safety issue in our workplaces and worksites, often associated with memory loss, brain fog, balance issues, hypertension, and diabetes. Expressing thoughts and emotions through journaling can be healing for body, mind, and soul. Clinical trials show that expressive writing about daily experiences can improve troublesome symptoms of depression, anxiety, pain and fatigue. 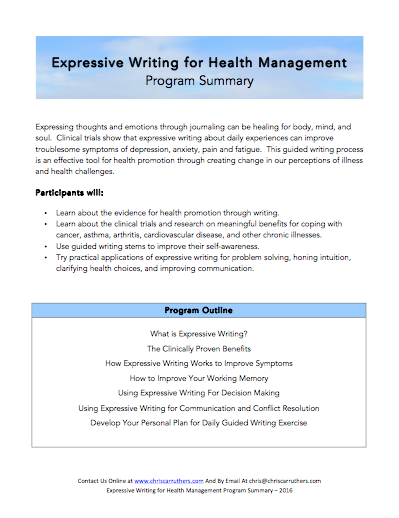 This guided writing process is an effective tool for health promotion through creating change in our perceptions of illness and health challenges. Chris Carruthers, B.Sc., M.Sc., Ph.D. exemplifies energy, knowledge, and professionalism. 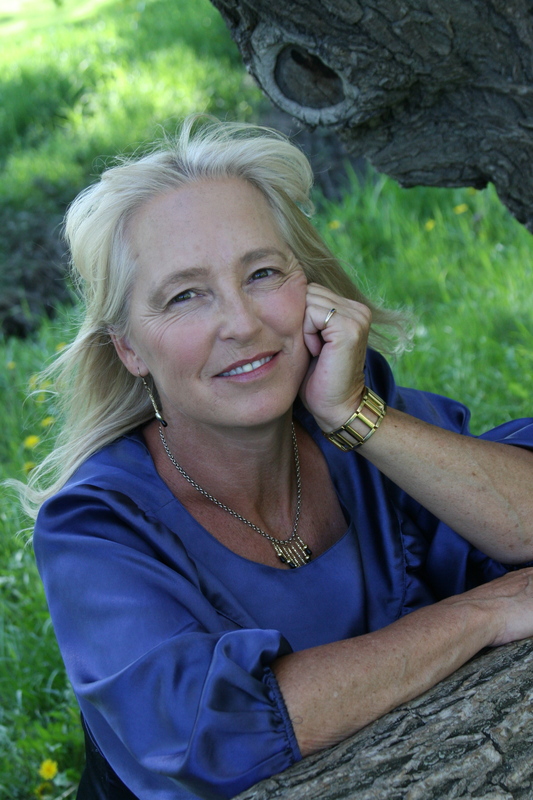 She has a graduate degree in Coaching and Exercise Physiology and a PhD in Integrative Healthcare. For over thirty years, Chris has been helping people recover from illness. She is most well known for her education in the fields of chronic disease management and integrative cancer care. Her most popular work is the Sleep Well Tonight program, which has helped thousands of people improve their sleep at night and their energy during the day. For everyone she serves, Chris uses the integrative health approach, that combines the best systems of medicine, practitioners, and practices into a personalized healing plan that considers all aspects of the individual. For more on Chris’ background, click here. “As ATB’s Corporate Wellness Manager, I knew that ‘get more sleep’ was one of our top 4 wellness goals year after year. 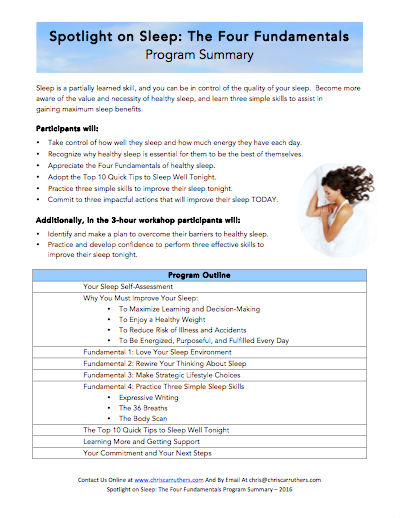 After attending a presentation by Dr Chris, I was inspired to design an ATB-wide wellness challenge all about sleep health, and was lucky to connect and collaborate with her on building our Sleep-Fest 2015 and 2016 events. The feedback after the first challenge was excellent so we decided to do it again the following year. Who Has Trusted Chris to Speak? Here is a sampling of organizations that have benefited from Chris’ speaking and the Sleep Well Tonight programs. She is an active member of the following professional organizations. We know what it takes to make your next meeting a success!